The search for new original songs of praise OPM returns in A Song of Praise (ASOP) Music Festival Grand Finals Night on November 13 this year. ASOP Music Festival announces today the 12 grand finalists and their interpreters who will perform at the Smart-Araneta Coliseum stage. The songwriters, including their interpreters, will vie for a total of Php1 million cash prizes. Last year, 19-year-old Noemi Ocio, who wrote “Kumapit Ka Lang”, bagged the grand prize pot of Php500,000. The 12 new songs of praise will be interpreted by known artists like ASOP Music Festival alumni: Gail Blanco, Brenan Espartinez, and RJ Buena. Performers who will interpret for the first time for this prestigious songwriting tilt include Sam Mangubat, Liezel Garcia, Zsaris, Apple Delleva, Kris Angelica, Dan Billano, Jay-R Siaboc, JV Decena, and Jay R.
As in each year, hundreds of eager amateur and professional praise songwriters submit entries to be considered for this celebrated songwriting competition. 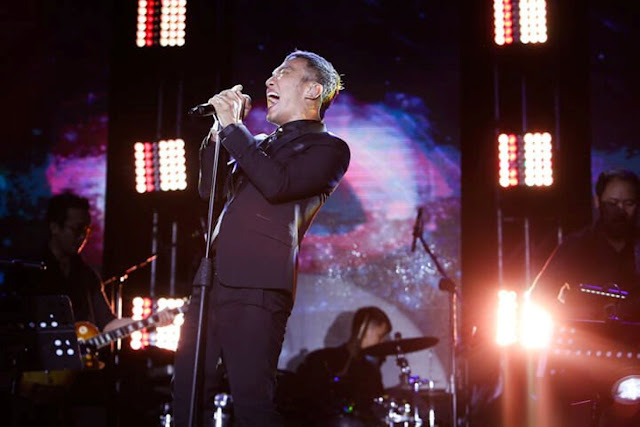 Aired via UNTV Your Public Service Channel every Sunday, weekly judges have the unenviable task of selecting the monthly finalists to go head-to-head on the Smart-Araneta stage after a year. The sixth edition of ASOP Music Festival will be remembered for featuring an eclectic mix of genre in music, from R&B, jazz, glam rock, pop rock, to ballad. Songs that reflect the songwriters’ fight with depression, hopelessness, battle with cancer, and death in the family. Another writer competing this year shared through his song how his life becomes complete after finding God. The online voting and power viewing to select the People’s Choice Awardee kicked off on November 3. Fans and supporters rooting for their grand finalists to clinch the People’s Choice Award can cast one (1) vote a day in the official website of ASOP Music Festival, using their Facebook and Twitter accounts. The winner of the popularity award will be selected based on total accumulated points from online voting (50%) and power viewing (50%) of the entries’ official music videos. One account, one (1) vote per day will be counted. Voting period will last until November 13, 2017 at 12 noon. 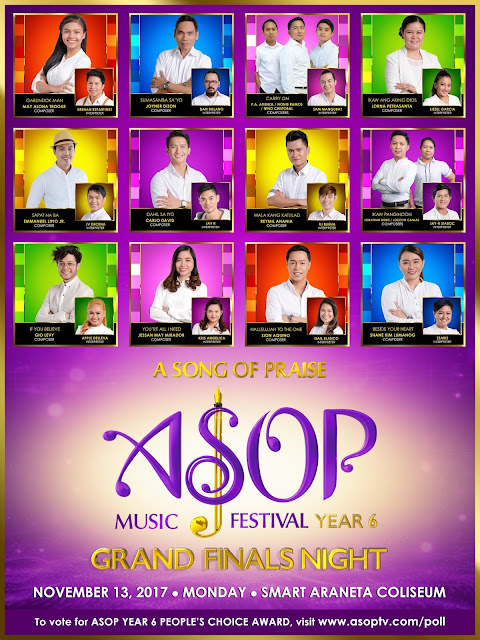 Labels: A Song of Praise (ASOP) Music Festival Grand Finals Night on November 13 this year.